With respect to a certain individual employee who had worked there previously and made such statements... Shame on you. As someone who has been employed at this exact same Canadian tire for five times the amount of time you had been there, I am strongly disheartened that you would make such claims. Yes, the store has problems; no one will dispute that. But I have told customers more times than shifts you have worked to go elsewhere due to us not carrying it, or they have it cheaper in another place. Many members of staff do what they can for customers. Your actions and your complaints are a personal attack on one specific individual; and seeing as you worked there, you should also know very well that no two managers are the same. The fact that you have the audacity to attack and demean is extremely disheartening. To anyone reading this review: The store is not perfect, nor will it be. But the staff that I work with, while young, I have seen to put the needs to customers first. I have seen staff break rules and policy for you. I have seen staff put things on hold when they arent supposed to, I have seen staff on their hands and knees trying to pull out that one cabinet left in stock that you so dearly wanted. I have seen staff go to the warehouse and grab another box of a cabinet or a bookshelf or otherwise because the glue had come off, or tape was ripped, or the box had been punctured. I have seen staff take the phone numbers and names of customers so that a manager may look for an item that the staff member could not find. Put it on hold when we do find it. There are going to be staff that you deal with that will not be wonderful and amazing and capable people - and no two experiences will ever be the same. But to take an assessment of the store as a single manager and a single staff member who may have had other incidents or problems that contributed to their firing that they may not have mentioned - I implore you not to. 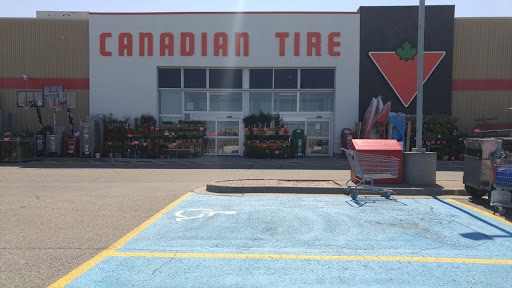 For me, this Canadian Tire has treated me well and many of my coworkers have gone above and beyond for customers when they did not need to. Im sorry to have to write a bad review, but my experience is one of significant safety that should be known. In June 2014, I was given a 2006 Mazda 5 from a friend. I was driving it from Ottawa to Calgary, with my grandmother in tow. As we were driving, I was not feeling great confidence in the breaks, so when I got to Sudbury, I stopped at Canadian Tire for them to do a road safgety, top fluids and take a gander at the breaks. They came back to say there were no breaks and the car needed major repair. I was in Sudbury for 2 days and by the time all was done, I had paid over $1800. When I got to Calgary, I parked the car in my garage and there it sat for a year. In June 2015, I decided it was time for the out or province inspection and to get the car on the road. Ill never forget the look of fear on the mechanics face. He said he could not pass the car.....the frame was too rusted. And fearfully shaking his head, he said the vehicle would not survive a crash, as he crushed his hands together like an accordion. For 12 mos. that vehicle sat in a warm garage. It was not used. I CANNOT believe that the mechanics at Canadian Tire on Regent Street in Sudbury, let my car sit in the air or two days, charged me for a road ready test and changed the breaks, but let me get on the road with a frame rusted beyond repair. The car has now been scrapped...... sold for parts only for $350.........I hope people read this review. I will never go to a Canadian Tire store (or affiliate) again. But at the very least, I hope no one ever uses the automotive department at this location again. The sheer negligence and greed is appalling. When my boyfriend and I sent our Ford Ranger in for a brake repair, they asked if it was a disc or drum. We told them we couldnt remember off hand but thought they were drum brakes. "Oooh, ok. Well Ill have to take a look." So they do and he quoted us a price of $350.00 for repair that was including labour. After we had dropped it off to be fully inspected and worked on we received a phone call later that day. Apparently, the work that we were quoted for and all of the other "recommendations" jumped from $350.00 to $3200.00! They said that the brakes in the front were the problem, but we knew it was the back. They said that the oil needed to be changed badly, but we had just changed it a mere 5 weeks before! Other recommendations were that we attach the muffler with something "more sturdy" as it will help with our air flow system. Suspension, Calipers, you name it, it was suggested as something that absolutely should be fixed but was up to us to choose if we wanted it fixed. We told them to just fix the brakes and they said, "Ok, but that is going to come to, with tax, $798.00." "And of course you want premium parts, which are on sale right now. Or economy. Actually, I dont know if we stock economy." It was a lot of wishy-washy sales slang and "genuine concern" for our well being. I am so disappointed with the greedy and self-serving attitude at this establishment that I will never go there for auto service again nor recommend it to any friends or family. Helpful & knowledgeable: If you need this type of assistance I can only recommend "Jessie in the tool/paint counter. He knows everything in the way you usually expect form a small hardware store owner. He has helped me every time to find the right tool and explain how best to use it (Im a DIY novice and dont always know how to use the tools I think I might need) Since I found this helpful assistance I have returned to buying tools and other reno items from Canadian Tire because I do get the support I need when selecting. Before that I had migrated to the Homehardware down the street. ................................... Automotive: Tires. Only used them once for installing my winter tires on my VW golf. No complaints, fit me in during busy time. Bring it in in the morning done by the end of day. Of course, had I decided to sit there and wait it might feel like a ling time, but sometimes you just have to leave your car at your garage so they can play with their daily schedule. Tires were installed and balanced well and old ones in the trunk in bags. I find it is a bad idea to sit and watch mechanics do the job because it just gets you mad how little they seem to work on your car (any mechanic). To Tacoma reviewer: Remember a lot of them use the book rates, not actual hours spent. I worked for this Canadian tire and I can tell you from the inside that this isnt a place you want to be shopping. This is the sort of place that is run by managers that want you to cover up imperfections in things for sale and still trick the buyer into purchasing things they really wouldnt want. They tell you to lie to the customer just to get their sale. I didnt realize I was signing up to not be a human from 9-5. I remember my manager had overheard me telling a young mum looking to keep up with her growing child and his need for new skates, I had told her to buy used and got scolded severely. A man was interested in buying a rifle and I had said to him there was a badly rusted part of the gun and I could get one from the back for him, manager had also overheard that. Result? I got fired. Just for those two incidents. Shame on you Canadian tire, shame.